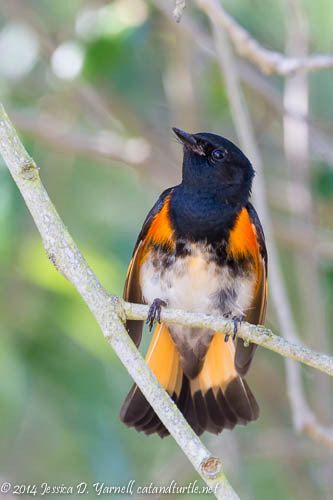 I had such a good trip to Fort De Soto on Easter weekend – complete with migrant songbirds and Royal Tern courtship – that I just had to return on the following weekend! 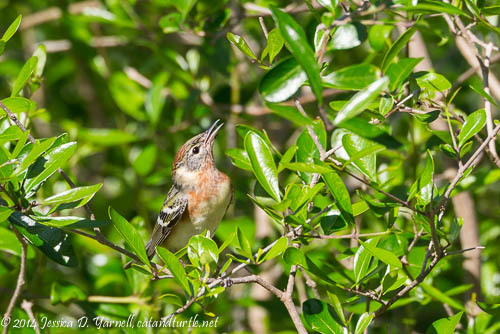 The winds had kept some of the migrant songbirds at Fort De Soto for a few extra days, and I took advantage of my off-Friday to visit the park when there were fewer people in the prime bird-watching spots. I ran into Michael and we had a great afternoon. Turns out Michael’s not a bad chauffeur! The best bird of the day was the Bay-breasted Warbler, who made a brief appearance in the privet near the fountain. This was a lifer for me. The Bay-breasted Warbler winters in Cuba and the very northern tip of South America. Then he migrates across the United States to his nesting grounds in Canada. This little bird really knows how to see the world! It was a joy to see him on his brief refueling stop. 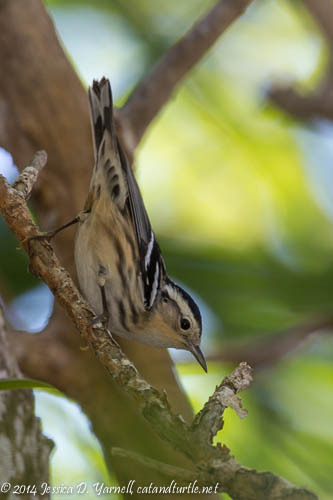 This female Black-and-white Warbler taught me a good lesson: never go to Fort De Soto for a weekend trip and forget to bring a copy of Sibley’s with you!! I had thought that the apps on my phone would be good enough for any identification quandaries, and I was wrong. My apps didn’t show enough detail in breeding plumage for me to positively identify this bird. I got all excited when I saw the orangey tints under her wings and chin. I kept hoping I’d found another lifer, but once I got home, I had to admit that she was “just” a Black-and-white Warbler. 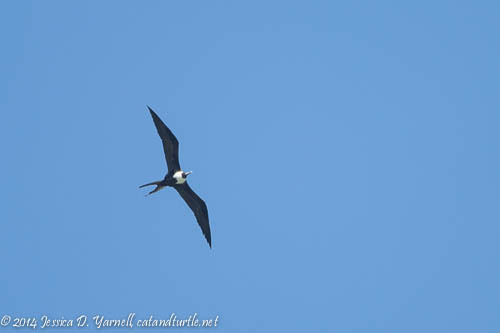 Still a fun bird, and she led me on quite a chase to try to get a clear shot of her! 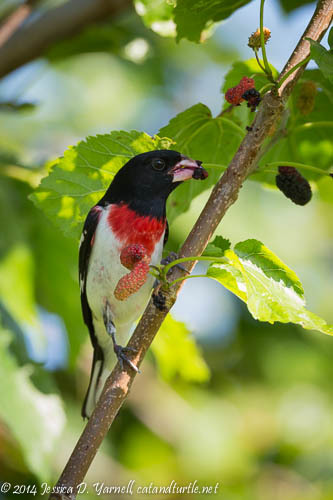 The Rose-breasted Grosbeaks continued to forage on the mulberries. There were significantly fewer berries on this trip than there had been just a few short days before! Hungry birds will pick those trees clean. This was my favorite Rose-breasted Grosbeak shot of both weekends. I love how his bright red tummy goes well with the bright red mulberries. I intended to use fill flash on this guy, but I mistakenly turned off my flash…oops! 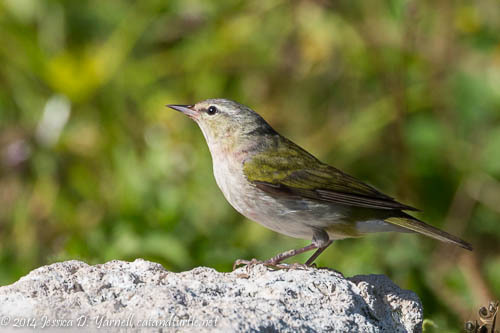 Another good bird of the day, although not a lifer for me, was this Tennessee Warbler. He stayed in the area of the fountain, and for two quick seconds he actually hopped to the fountain to pose. Like the Bay-breasted Warbler, he’s on his way to Canada to nest. I’d love to make a fountain like the one at Fort De Soto for my own backyard. It’s a birdie magnet! 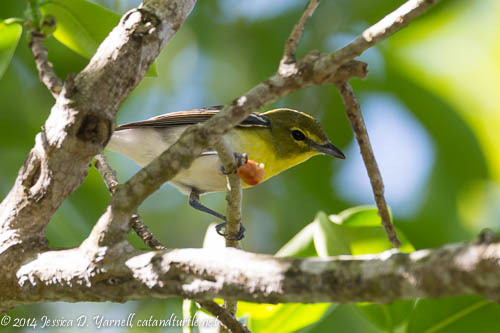 This Yellow-throated Vireo found a clump of mulberries almost directly over my head. I love how he peered down at me in between bites. Thank goodness I had my tripod. It’s hard to aim a Beast directly overhead! It was hard to tear ourselves away from the migrant songbirds at Fort De Soto, but sunset at North Beach awaited us. 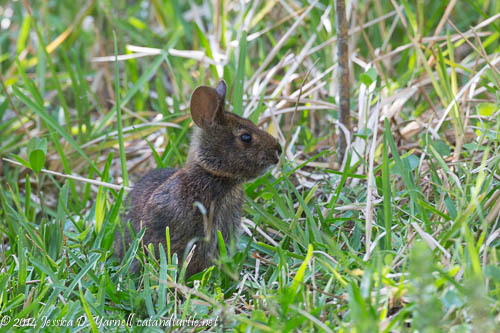 As Michael and I left, we ran into this little rabbit on the pathway. Not a migrant, but he was pretty cute anyway! You can read more about our North Beach photography adventure in the next post. Stay tuned!